Cynicism was not so much a philosophy, but a way of life characterized by asceticism, anti-conformism and anti-conventionalism. The Cynics are regarded as one of the minor Socratic schools. It was founded in the fourth century BC by Antisthenes the Athenian. The name ‘cynic’ derives from the Greek word for ‘dog’ (kuon) denoting their denial of luxuries, wealth and social status. The core of cynicism is the virtue of well being and happy life beyond any conventional value. Eminent Cynics were Diogenes of Synope and Crates of Thebes. 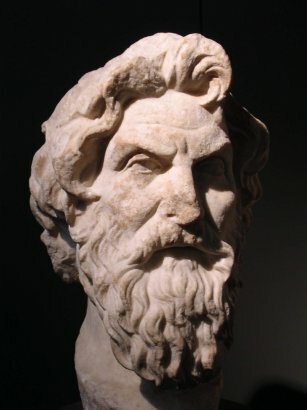 Cynicism had a strong influence to Stoic philosophy. And the doctrines he adopted were these. He used to insist that virtue was a thing which might be taught; also, that the nobly born and virtuously disposed, were the same people; for that virtue was of itself sufficient for happiness. And was in need of nothing, except the strength of Socrates. He also looked upon virtue as a species of work, not wanting many arguments, or much instruction; and he taught that the wise man was sufficient for himself; for that everything that belonged to any one else belonged to him. He considered obscurity of fame a good thing, and equally good with labour. And he used to say that the wise man would regulate his conduct as a citizen, not according to the established laws of the state, but according to the law of virtue. 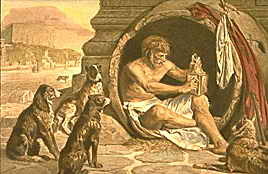 Diogenes of Sinope (c.400-c.325 BC) was a follower of Antisthenes and probably the most popular of the Cynics. Plato called Diogenes ‘Socrates gone mad’. He had an extreme personality with strong views. He denied pleasure and physical wealth for asceticism. He had the nickname ‘the dog’ because of his shamelessness. He used to live in a barrel with only possessions a robe to wear and a stick to walk. There are many stories for Diogenes’ rebellious and anti-conformal character. 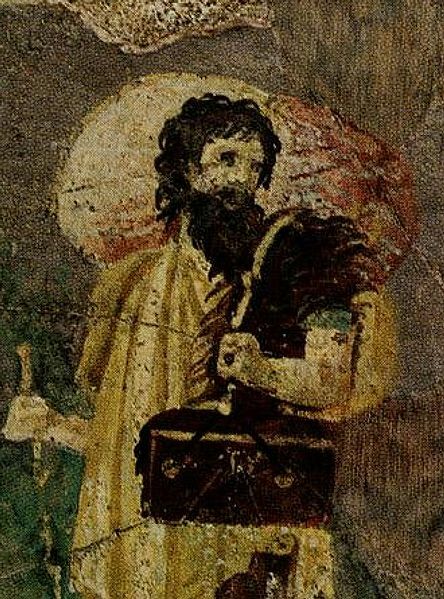 According to some ancient sources Diogenes carried a lighted lamp in broad daylight looking in the streets of Athens for the honest man. But the most famous anecdote of his life is related to Alexander the Great. When Alexander stood before him and asked him if he had any desire, Diogenes asked Alexander to move a little to one side because he was blocking the sun. There lived a wise man in ancient Greece whose name was Diogenes. Men came from all parts of the land to see him and talk to him. Diogenes was a strange man. He said that no man needed much, and so he did not live in a house but slept in a barrel, which he rolled about from place to place. He spent his days sitting in the sun and saying wise things to those who were around him. When Alexander the Great came to that town he went to see the wise man. He found Diogenes outside the town lying on the ground by his barrel. He was enjoying the sun. "Diogenes, I have heard a great deal about you. Is there anything I can do for you?" "Yes," said Diogenes, "you can step aside a little so as not to keep the sunshine from me." "Say what you like, but if I were not Alexander, I should like to be Diogenes." Crates (fl. c.328-325 BC) was a Boeotian from Thebes. He is the most famous successor of Diogenes and the principal master of Zeno of Citium, the founder of Stoicism. He was a popular figure in Athens. He used to reconcile family quarrels and give practical and moral advices to the Athenians. As for the other Cynics, Crates believed in the ascetic way of life. Happiness is self-sufficiency and not the balance between pleasure and pain, since in our lives the moments of pleasure are surpassed by the moments of pain.